The day begins by filling 2.2-pound pouches of rocky road-flavoured powder that will eventually be an athlete’s morning nutrition break. After filling 5.5-pound bags of that same flavour, the Kentucky-based manufacturing team for the Myprotein sports nutrition brand switches to cookies and cream, starting with 1.1-pound pouches and working their way up. A 10-hour shift moves quickly. Myprotein is a brand owned by The Hut Group (THG), a British e-commerce company that operates more than 100 international websites selling fast-moving consumer goods directly to consumers. The team in Kentucky processes nearly 35,000 pounds of product each day, making constant adjustments to package size and flavour to meet many SKU requirements. The throughput of the manufacturing team is impressive, but so too is the quality of product leaving the facility: consistency and safety are paramount. This relentless focus on quality is why brands such as Myprotein are constantly looking for new technologies that enable greater vigilance without disrupting tightly managed production processes. Advanced X-ray inspection equipment is one of these new technologies and it can reliably detect random foreign objects in food products, including drink powders, to protect consumers and preserve the bottom line. With Myprotein, a unique challenge is the pouch itself, which contains metallised film. This can pose challenges on an assembly line that uses traditional metal detectors. Running the sealed pouches through a metal detector prior to preparation for shipping could miss a small metal contaminant because of the large signal from the pouch itself. If, for example, a tiny piece of metal from a screw matched the unique metal signal of the pouch, it could pass inspection and be on its way to a customer. This required the team to use traditional metal detectors on the powder prior to filling. 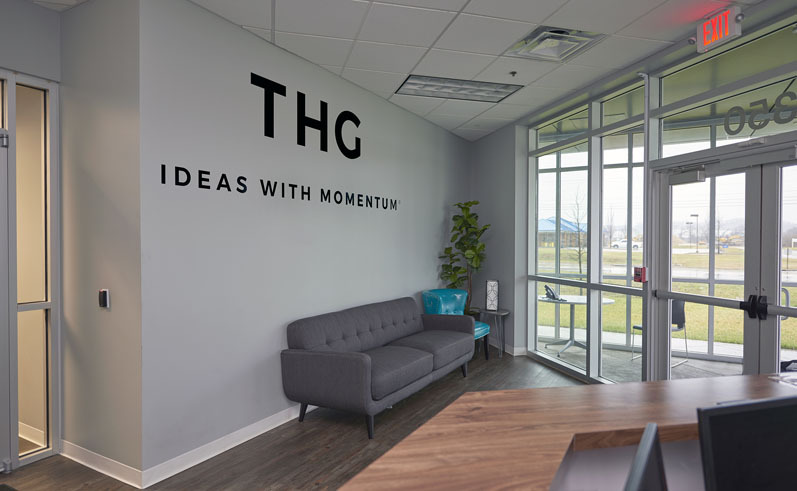 “We recognised the risk of running metal detectors before the product was in its final packaged form,” said Steven Kirkness, Group Head of Engineering, The Hut Group. 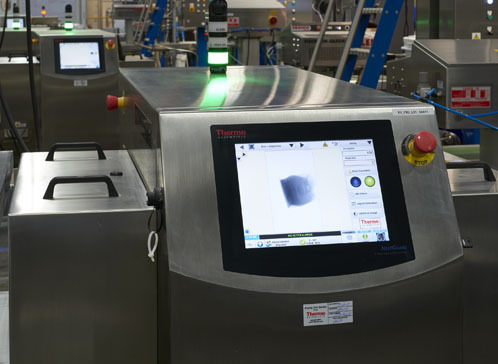 To inspect after “last touch,” Kirkness and his team transitioned their contaminant detection technology from metal detection to X-ray inspection, installing seven Thermo Scientific NextGuard Pro X-ray detection systems in 2017. These easy-to-use systems project a wide X-ray beam from the bottom up to a non-linear detector, which ensures complete inspection regardless of where a product passes through the X-ray beam. 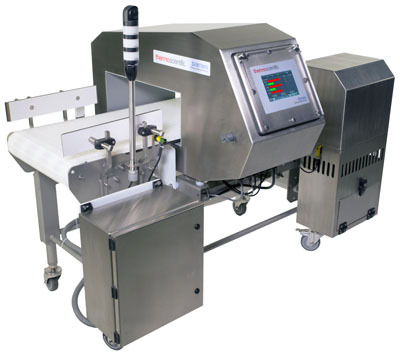 Because the metallised film packaging is extremely thin, the x-ray beam passes right through it, making it possible to detect contaminants 50–75% smaller than with a metal detector. 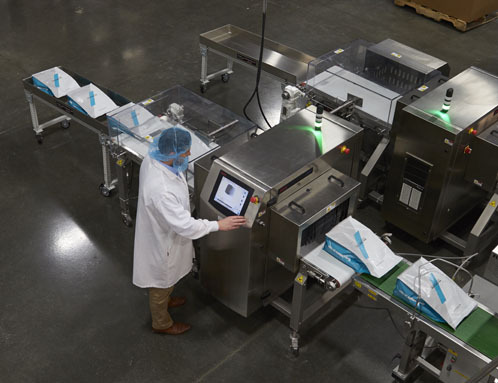 Transitioning from metal detectors to X-ray systems is increasingly common in the food industry, including the nutrition and supplement market, but understanding when, why and for which applications X-ray is more suitable than metal detection requires careful consideration. The Myprotein case study is one experience that can guide decision making for other manufacturers, but each customer application is different and factors such as the optimum detection point, overall application capability and total cost/benefit should be considered. Throughout the food industry, metallised film or foil packaging is commonly used to extend product shelf-life, improve moisture retention, prevent oxygen and UV-light exposure so consumers have a more consistent product experience. It also offers greater packaging design flexibility. The trade-off for these benefits is that traditional metal detectors, which are typically operated at lower sensitivity levels to avoid false positives, can miss certain contaminants. Advanced X-ray inspection systems not only detect metal at greater sensitivity levels, but also have the added advantage of detecting fragments of glass, stone, plastic or bone. The move to X-ray inspection was welcomed by operators on the Myprotein production line. Using the NextGuard systems eliminates much of the guesswork required when operators initiate a change in flavour or pouch size during the production process. Now, they can quickly and easily enter the parameters for the next production run, requiring minimal disruption during changeover and enabling them to check and double-check that new parameters match the upcoming run. Contamination events are rare, but it only takes a single foreign object to affect consumer safety and brand reputation. Investing in advanced X-ray detection can protect against what would be an even higher cost of recall and reputational damage in the future. For THG and Myprotein, X-ray detection has been yet another important step forward in its commitment to quality and consumer protection. 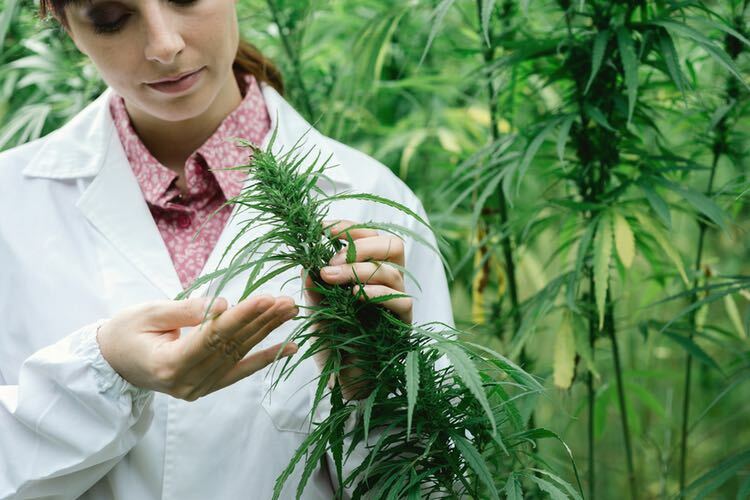 By moving its final inspection to the sealed packages, it now delivers another layer of protection against contamination of any kind reaching consumers.